Lock in a great price for Maldron Hotel Smithfield – rated 8.2 by recent guests! The staff was nice, it was safe and the rooms were clean. Location in Smithfield area- interesting and still convenient. This was great value for money, comfortable and nice place to stay. Staff were very helpful. Rooms were clean and comfortable. The maid service was exceptional. The location was excellent. 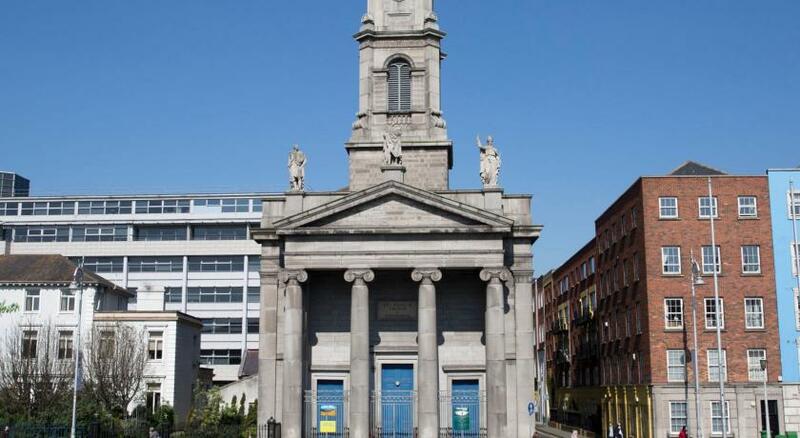 Close to public transportation services including the LUAS, hop on hop off buses and airport link. Close enough to walk to many sightseeing locations. Decent restaurants nearby and there's also a local grocery store next door to the property. We had a suite which was a very generous size. The beds were comfortable. The breakfast was decent. There were many options to choose from so there was something everyday that my picky son had to eat. The staff was great. Really worked hard to meet are needs. Very friendly. Had breakfast for us early because we had places to be! Good location. Very clean and comfortable . Maldron Hotel Smithfield This rating is a reflection of how the property compares to the industry standard when it comes to price, facilities and services available. It's based on a self-evaluation by the property. Use this rating to help choose your stay! One of our top picks in Dublin.The Maldron Smithfield Hotel is just 3 LUAS tram stops away from O’Connell Street. It offers sleek, modern rooms with panoramic city views, and WiFi throughout the property. 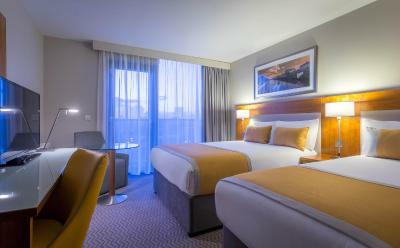 The spacious rooms at the Smithfield Hotel boast a TV, a safe and either floor-to-ceiling windows or balconies with panoramic views of the city. The private bathrooms all provide power showers. Grain & Grill Restaurant & Bar offers Irish and European cuisine 7 days a week. 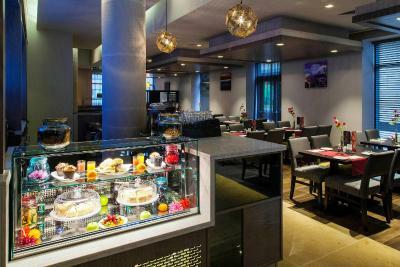 The restaurant offers a full breakfast buffet with hot and cold selection, a lunch menu and dinner menu. 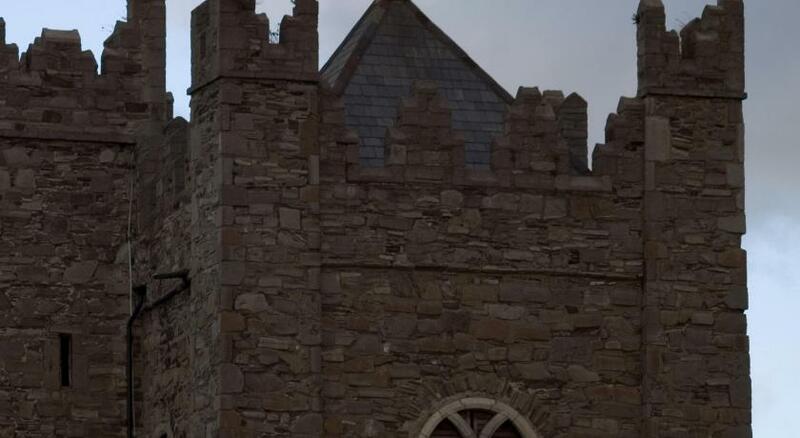 Dublin Castle and the Guinness Storehouse are within a 10-minute walk. 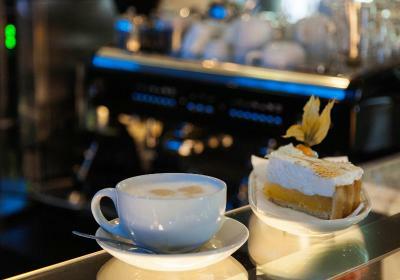 Fantastic restaurants, shops and bars surround the hotel, which also offer private parking. 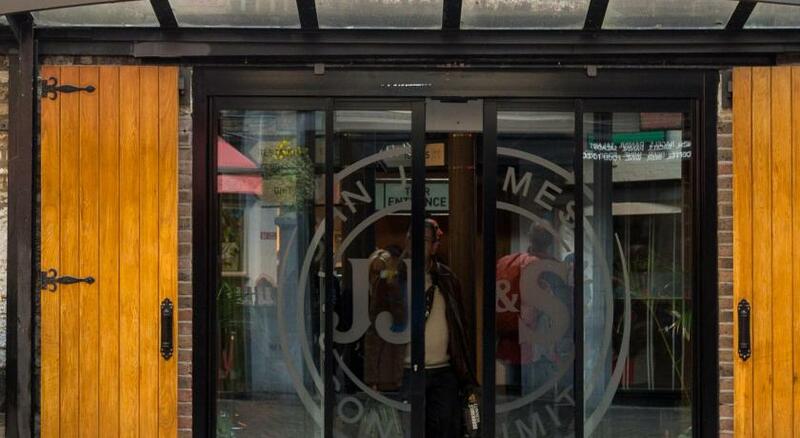 The lively Temple bar district is just 10 minutes away by tram, and both the Old Jameson Distillery and the Smithfield LUAS station are a 2-minute walk away. When would you like to stay at Maldron Hotel Smithfield? Double Rooms feature free WiFi, a TV and an private bathroom with bath and power shower. The hotel also has 5 adapted rooms for guests with special needs. 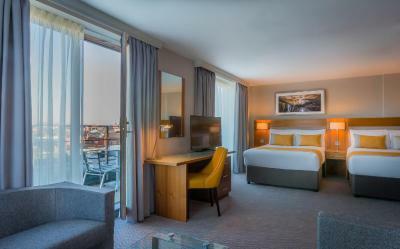 Suites offers 2 double beds, a separate lounge area and a private terrace with panoramic views of Dublin City and the Dublin Mountain Range. Free WiFi, floor-to-ceiling windows and a TV are provided, along with an en-suite bath and power shower. Please note the suites can take a maximum of up to 4 guests. Twin Rooms feature free WiFi, a TV and an private bathroom with bath and power shower. Triple Rooms feature free WiFi, a TV and an private bathroom with bath and power shower. 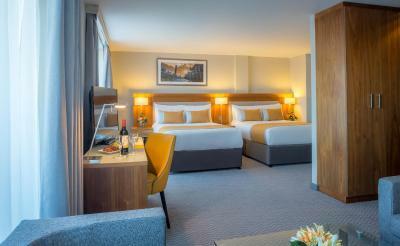 These spacious contemporary rooms have bathrobes, slippers, chocolates and complimentary water. There is also a safe, a flat-screen TV, a hairdryer, tea/coffee making facilities, a trouser press and an iron with an ironing board. 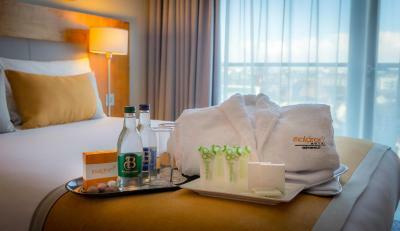 All executive rooms offer panoramic views of the Dublin skyline and Smithfield Square. All rooms are en-suite with large bathrooms equipped with a bath and shower. House Rules Maldron Hotel Smithfield takes special requests – add in the next step! Maldron Hotel Smithfield accepts these cards and reserves the right to temporarily hold an amount prior to arrival. It’s my second time in this hotel and the location is incredible easy for everything,if you drive like me is easy and car park is just next to the hotel with a very good price.if you walk is just 10 mins to temple bar and shops.close to nice bars and restaurants. Uncomfortable bed. Expensive for what you get. Just a minutes walk from the Luas so I liked that it was a central location. The staff were super kind, the breakfast was epic, and we had a beautiful rooftop view from our room. So much noise audible from neighboring rooms and the radiators clanked every morning at 5am. Hotel was very kind in moving us, but radiator noise must be in every room. The company I work for is based locally and we use this hotel, many guests seem to have this problem. Also there is something up with tv's and the channels. Picture blurry or no signal. Again, it happened in more than one room. Great staff, great location versus cost and wonderful breakfast. Could of had a few more towels for the bathroom as there were two of us staying and had to share 1 towel but otherwise good! The room was really clean and the staff were very lovely and helpful And provided information for how to get around. Hop on, hop off bus stop was like 2 minute walk away so it was really convenient to get to town and back. Would have been nice to have 3 towels in the room to begin with, as the hotel knew three people were staying but only provided us with one large towel and a medium. Staff were very helpful when we asked for an extra towel. Strange railing in the shower made it a bit difficult to move around and wash hair, would have preferred it not to be there but it was fine. No overhead lighting in the bedroom, so lighting was a bit poor, but lots of windows which helped. Great staff who were super helpful. Good sized room with nice decor, great for 3 friends on a weekend away. Spacious bathroom, good water pressure. The hotel, was very easy accessible and the very quite and comfortable. No sleep due to terrible whistling nosies coming through the balcony door. 2adults and 2children, none of us slept all night. Pillows either rock hard or flat as a pancake. We had booked in for breakfast when we checked in but when we came down in the morning we were told it was too busy and were basically turned away. The chap on reception did sort out the breakfast issue and we were given it complimentary for the sleepless night. Not a great start to the week away. Thankfully we are staying elsewhere for the rest of our trip.